This article is about the town. For other uses, see Carbonado (disambiguation). 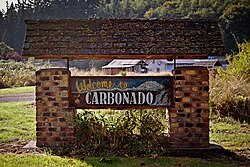 Carbonado was one of quite a few towns in the Carbon River valley to be settled during an economic boom in the region. The boom was brought on by raw material demands in nearby growing towns such as Seattle and Tacoma. Starting with the town of Burnett and moving on through Wilkeson, Carbonado, Montezuma, Fairfax, and finally Manley Moore, these settlements sprawled up the valley to the very boundary of Mount Rainier National Park. Most of these towns were company towns, meaning that they specialized in the harvest of raw materials owned the plot of land that the town was situated on and that the resources were harvested from. Often—and such was the case of Carbonado—the company also owned the houses and the energy resources as well. The energy resource in Carbonado was also the raw material that the citizens of the company town were harvesting, coal. During the time of the initial boom in the valley Carbonado grew to rival the size of Tacoma at the time. The railroad, which was integral to the transportation of people, of the raw materials harvested and the supplies need by the towns, stretched all the way up the valley too. Not only did it service the towns but also several homesteads farther up the valley. These homesteads were settled predominantly by Polish immigrants. They supplied the towns down the valley with fresh milk and eggs. Two survive to present day, one known as Carbon River Ranch (the main house is the old Fairfax school and can be seen from the highway) and the other formerly known as Huckle-Chuck. At Huckle-Chuck the original homesteaders house and one of their barns are still used and functional. At the peak of the boom both of these homesteads and the towns which they supplied were quite productive and lively. However, the boom did not last as the economy took a downturn and with it came the end of the need for the lower grade coal being mined at Carbonado and the timber being harvested for use in the settlements further up the valley. Since the decline of the mining era, Carbonado has experienced extreme shrinking and small booms ultimately ending with a steady population. All of the current residents work elsewhere and what was once an economic center for the valley is now a residential community. The railroad also pulled out and destroyed its towns quite recently. The Rails to Trails project has most of the actual rail line land in its possession. The time that Carbonado did spend as a coal mining town is forever kept by the cemetery, abandoned mines, a grown-over coal slag pile, a school, and the company houses left behind. The cemetery holds the memories of older and more recent dead with many of the graveholders family still living nearby. Huge concrete monoliths that once held that cables for the mining carts, point straight towards the old mine shafts and openings and stand overgrown and utilized now only by the town's children. One hill in town started out as the coal slag pile and now has been carpeted by ivy and trees. The school makes up what is known as the Carbonado Historical School District and grades K-8th still attend there. Many of the houses that the company built and originally owned still line main street. They look very similar to each other as was the style of the company builders at the time. And though many of the miners abandoned the town, in some of those houses still live the direct descendants of the original miners. Carbonado was officially incorporated on September 13, 1948. Carbonado is located at 47°04′47″N 122°03′05″W﻿ / ﻿47.079724°N 122.051433°W﻿ / 47.079724; -122.051433 (47.079724, -122.051433). According to the United States Census Bureau, the town has a total area of 0.42 square miles (1.09 km2), all of it land. As of the census of 2010, there were 610 people, 208 households, and 153 families residing in the town. The population density was 1,452.4 inhabitants per square mile (560.8/km2). There were 218 housing units at an average density of 519.0 per square mile (200.4/km2). The racial makeup of the town was 93.1% White, 0.7% African American, 1.0% Native American, 1.1% Asian, 0.2% Pacific Islander, 1.5% from other races, and 2.5% from two or more races. Hispanic or Latino of any race were 4.8% of the population. There were 208 households of which 39.9% had children under the age of 18 living with them, 57.7% were married couples living together, 6.7% had a female householder with no husband present, 9.1% had a male householder with no wife present, and 26.4% were non-families. 18.8% of all households were made up of individuals and 5.8% had someone living alone who was 65 years of age or older. The average household size was 2.93 and the average family size was 3.37. The median age in the town was 34.9 years. 43.2% of residents were under the age of 18; 9.3% were between the ages of 18 and 24; 27.2% were from 25 to 44; 24.7% were from 45 to 64; and 10.3% were 65 years of age or older. The gender makeup of the town was 52.5% male and 47.5% female. As of the census of 2000, there were 621 people, 200 households, and 158 families residing in the town. The population density was 1,527.9 people per square mile (584.8/km2). There were 210 housing units at an average density of 516.7 per square mile (197.8/km2). The racial makeup of the town was 96.46% White, 0.48% Native American, 0.64% from other races, and 2.42% from two or more races. Hispanic or Latino of any race were 1.93% of the population. There were 200 households out of which 48.0% have children under the age of 18 living with them, 68.5% were married couples living together, 4.0% had a female householder with no husband present, and 21.0% were non-families. 17.5% of all households were made up of individuals and 8.0% had someone living alone who was 65 years of age or older. The average household size was 3.11 and the average family size was 3.56. In the town, the population was spread out with 34.9% under the age of 18, 7.7% from 18 to 24, 29.8% from 25 to 44, 20.5% from 45 to 64, and 7.1% who were 65 years of age or older. The median age was 30 years. For every 100 females, there were 110.5 males. For every 100 females age 18 and over, there were 108.2 males. The median income for a household in the town was $50,250, and the median income for a family was ?? Males had a median income of $38,583 versus $24,821 for females. The per capita income for the town was $16,135. About 1.4% of families and 4.0% of the population were below the poverty line, including 2.9% of those under age 18 and none of those age 65 or over. Frank Robinson, founder and CEO of Robinson Helicopters was born in Carbonado in 1930. Carbonado School District is a historical school district which started in 1887. Paul Strand, pitcher (6-2), World Champion Boston Braves, born in Carbonado, 1893. Hall, Nancy Irene (1994). Carbon River Coal Country, Orting: Heritage Quest Press; ISBN 978-0945433330. Carbonado, Washington Photograph Collection. 1890-1905. 6 photographs. Marsh Morgan Corbitt Photograph albums. 1905-1918. 1050 photographs (2 boxes); various sizes. Arthur and Freda Hancy Photograph Collection . 1909-1914. 10 photographic prints (3 folders); 5x7 inches (12.7 cm x 17.78 cm). Pacific Coast Company records. 1883-1927. Approximately 41.43 cubic feet (1173 liters, 1.17 m³) plus microfilm. Wikimedia Commons has media related to Carbonado, Washington. ^ "Population Estimates". United States Census Bureau. Retrieved July 8, 2016. This page was last edited on 28 March 2019, at 15:21 (UTC).